The best way to keep your bagels fresh is to freeze them the same day you buy them. Simply slice the bagel, put them in a plastic bag and place them in the freezer. 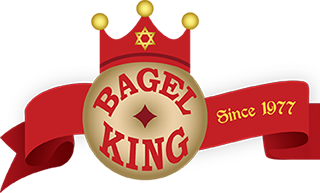 When you want to have a Bagel King bagel at home, pull one out of the freezer and pop it right into the toaster oven frozen. It’s that easy! Enjoy! Honey roasted chicken salad, albacore tuna salad, chunky egg salad, jumbo smoked white fish salad, crisp sweet coleslaw, red bliss potato salad. All of our cream cheese schmears are made with Philadelphia cream cheese base – yum! Great on our cinnamon sugar glazed bagel! Great smothered on our everything bagel! Dunk your bagel chips in a tub today! Let your counter representative know your great ideas and tastes! seafood or eggs increase your risk of foodborne illness.